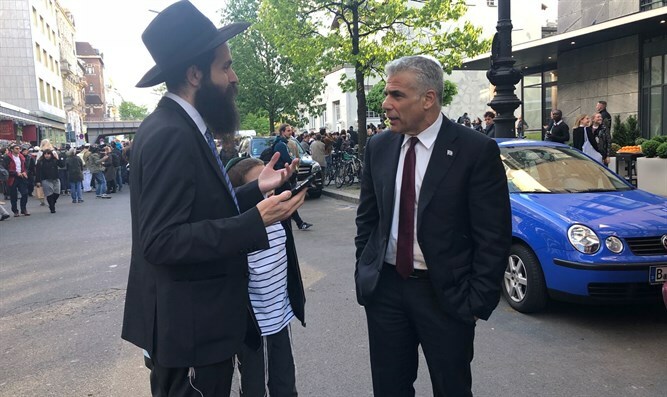 Yesh Atid Chairman Yair Lapid, who is on a political visit to Berlin, arrived Wednesday evening for the “kippah march” in the city. Lapid, who is in Germany as part of a campaign he is waging to make Hezbollah illegal in Europe, said that he decided to come and express solidarity with the Jewish community in Berlin, to wear a kippah and march with head held high along with the other participants. "I came to Berlin as part of our concerted effort to get the EU to define Hezbollah as a terrorist organization and to stop the money earmarked for terror. The moment I heard that the head of the community here told Jews not to walk around with a kippah in the streets because of anti-Semitism, I went and bought the biggest kippah I could find in Berlin. I wore it and came to a demonstration against anti-Semitism with hundreds of Jews and non-Jews who all wore a kippah and told anti-Semites, 'You will fear us, we will not fear you,'" Lapid said. "It is inconceivable that Jews would be afraid to wear kippot in Germany in 2018. I will not accept that we and our children are afraid as our parents and grandparents were afraid. Anti-Semitism has always been and always will be; The question is what the Jews do. We have a state, because of that we have an army, because of that I can march today in Germany and tell anti-Semites to go to hell."